Kindness Counts! And, it Makes This Organization Thrive. 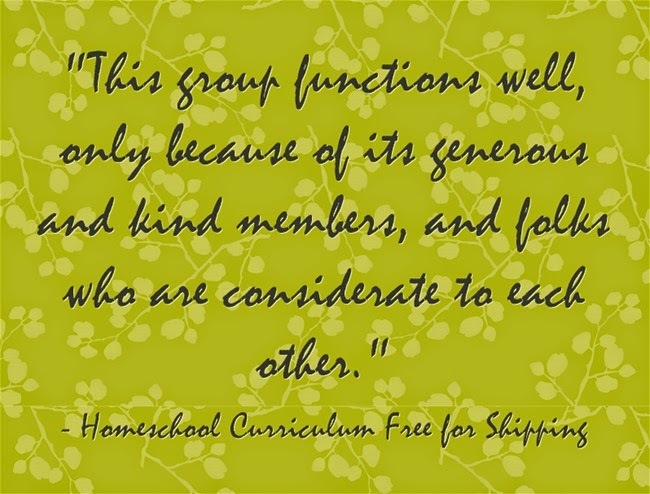 Homeschool Curriculum Free for Shipping was created as a way for homeschool families to help other homeschool families, particularly those in need. It's goal is for members to share their materials with each other, not expecting anything in return. Members pay forward the generosity received, by sharing with others when they are able, whether it be by passing along the resources they receive when they are finished with them, or by sharing free resources they've found on the web. One concern that we need to address is the issue of increasing numbers of recipients not following through by paying the shipping fees once they've been offered an item for which they've expressed a need. This group functions well, only because of its generous and kind members, and folks who are considerate to each other. The following announcement is being made to encourage kindness from both sides - the donors, and the recipients. Please read, and help us as we strive to maintain the integrity of our growing group. Yes, there is a chance that the item you are giving away will be turned down by the person you've chosen to receive it. The fact is that the larger population of this group are families who are struggling financially, and you can expect a few of them to post a comment one day in which they have the money to pay the shipping, but yet a few days later when they've actually been offered your item, they suddenly can't pay for it. That is understandable, and we can't expect to ask them to pay the shipping if they have no money in their bank account at the time it's offered. I speak from personal experience - having had money in my own bank account one day, and then suddenly it's gone the next (and our family has even been stranded without gas on a long distance trip before, due to such circumstances). So I know it can happen. If you've never been there before, it's very difficult to understand how these things happen, but they just do. However, it shouldn't happen often, and we are doing all we can to prevent it. At this time, all we can do is encourage recipients not to comment with interest if they suspect they may not have the money for shipping when the item is offered. Future plans for this organization will solve this issue, with funds for website development, but until then, we must do the best we can with what we are able to do. The volunteer moderators and I can't possibly police the group enough to monitor this issue. If you donate, you must expect that those you are dealing with may not be in a position to accept your donation. You do not have to *wait* on them for payment longer than you are willing. You may choose to inform them of your choice to move on to someone else, within any time frame you wish. You do not have to feel persuaded into negotiating your original offer (such as paying the shipping for them if you originally did not intend to). Also, make sure you are aware of all the options that are available to you as a donor. It has come to our attention that there are frequent mind-changers. This is unfortunate and inconvenient for the donors. When a family is struggling financially, a sudden lack of funds is occasionally un-predictable, and we do understand that there are sometimes circumstances beyond your control. However, please try to be considerate to the other participants in this organization by trying your best to prevent such situations. Please do not post that you are interested in an item being offered, if you KNOW you cannot pay the shipping. Expect the shipping costs to range from $2-6 for the things you comment on. Only comment on the things you really do *need* (because what if you got lucky enough to receive more than one thing, and then couldn't pay the shipping costs?). If you can't afford your groceries this week - don't ask for things on here this week - it's just not wise. Donors are reporting up to 50% of their items being turned down after offering them to recipients. That's really too high - we would expect that if you're asking for an item, you are ready and willing to pay for the shipping should you be selected to receive it. We would like for the percentage of recipients who fail to pay the shipping costs to be more in the 1-in-10 range. Also, donors are generous and have huge hearts, but they can't be expected to pay the shipping for you just because you somehow can't afford it now that you've been offered the donation. They also cannot be expected to *wait* on your next paycheck, etc. Please do not PM the moderators with a grievance about this. We have given the donors control and freedom to give as they choose, and some of them understandably do not want to wait. We ask that you please think twice before commenting on something you need, to be sure you really do *need* it and can pay the shipping cost, and save these awesome donors a little bit of hassle - they certainly do not deserve it. Be considerate before requesting a donation. Thank you!